Let’s keep in mind that my friend is not the norm. I don’t believe every single person out there would have reacted in the same way she did. In fact, I strongly believe that for every person who cares, like she did, there are as many who don’t. And this is the difference between those who choose to live awakened lives and those who don’t. Those that choose the path of consciousness care about things like their word and their commitments. What they put “out there” in the Universe, matters. It matters a great deal. Why does it matter you might ask? It matters because they understand that there is a reciprocal relationship between the things we put out, as in “give” to the Universe and what we receive back. If our “giving” is not clear, consistent and committed, then what we receive back will not be either. Everything in life is based on an equitable exchange of energy. It may not feel equitable to our naked eye, but it is. It all eventually evens out in the grand scheme of things. When the exchange of energy is clear and committed, then every party in the relationship benefits. Of course, this can happen best when each person is conscious of the energy they bring to the equation. Let’s break down what this equation of giving and receiving really means. There are many who believe that giving and receiving are two separate things. This is highly erroneous. A downright delusion. Giving and receiving are in fact, one and the same thing. They are literally the same act. I can just hear your confusion whirring. You might have never heard of such a thing. You may even feel indignant as when you have “given” to another, you feel as if you have definitely “given” – in that, there was no receiving occurring, only giving. It is because we believe that giving and receiving are two separate acts that we experience things like caregiver burnout. You have probably experienced this yourself. It occurs because the caregiver feels as if all they do is give of themselves and receive nothing back in return. Quite naturally, with such an attitude, one feels completely sucked dry of resources at the end of the day. What if we re-hauled our entire way of looking at the equation of giving and receiving. What if we felt we actually were the receivers when we were participating in the act of giving? How would that feel? When I was a therapist in my twenties, I consistently experienced burn out. I was always exhausted, cranky and eventually, resentful. I began to loathe those I was counseling and began to see them as energy-suckers. I became gloomy and irritable. Until it all changed, in one sudden swoop of insight. I realized that I had created an entire movie in my head where I was the undying martyr and victim of the story. Much like my mother and the women I was raised with, I too saw myself as a “giver” – and then of course, as the supreme martyr. Truth be told, there was a huge payoff to feeling like this. It evoked sympathy from my loved ones and allowed me to place myself on a pedestal of self-sacrifice and saintliness. I loved it…and I hated it. I was trapped. I couldn’t get out of the cycle. It was only when I saw how I had created this movie based on an ancestral script that I could break free from it. I saw that I was simply regurgitating an old pattern and just following how I saw other women in my family act. They gave, gave and gave some more and crumbled into a heap of exhaustion at the end of the day. They would then become bitter toward those they were “giving” to and withdraw affection and genuine care. Love was an obligation not a joy. I changed my entire relationship to giving from that day on. I began to consciously choose when I gave. I no longer gave blindly, simply because I was “supposed” to. As a result, I began saying “no” more often, of course, and I probably lost a lot of friends, but at least I was being authentic. When I began to incorporate this new belief system around giving, my entire heart began to open. I began to receive much more than I thought I was giving. More importantly, I was no longer stressed or burnt out. On the contrary, I was overwhelmed by endless energy and boundless spirit. I had finally unlocked the key to joy: the act of giving to another is first and foremost an act of giving to the self. It is in this wisdom that we learn to receive as we give. The giving and the receiving occur at the very same moment in time. This new way of consciously choosing to give has challenged me to become very clear about my BOUNDARIES. It has made me confront my fears around saying “no,” and disappointing my loved ones. I had to wade through the marshes of my fear of conflict and learn that conflict was inevitable in relationships, often even healthy. I also realized how attached I was to being seen as the “good one.” I so wanted to be “seen” as someone selfless and giving that it overrode the fact that the giving was coming from a bitter place. As long as the “other” thought I was “good,” that was all that mattered. I slowly began to see that beneath this entire idea of giving was a narcissistic and self-absorbed desire to be seen as someone…who I actually wasn’t. It was hard at first to let go of this image I wanted to keep: The Good One. But slowly, I was able to discard it for something far more important: The Authentic One. instead, fully embrace the notion that when you give you are actually receiving something from this act. Tap into what you are receiving. Open your heart and be grateful for it. And in this way, your cup will runneth over. This is the most clear and fantastic explanation of the sometimes blurry concepts of giving and receiving. I can relate to your story in your early twenties. I too was an over giver who became exhausted and resentful at some point. Freedom from this kind of giving is the most rewarding. Giving and receiving are truly simultaneous acts. The authentic joy we feel in the act of giving keeps the flow open and the heart warm. its always about the heart. follow the rruth in your own heart. constantly giving ofcourse burns someone out.. we cant save everyone and thousands of people have expectations.. the biggest disaster ever. expecting others to behave how we behave.. i was big on always expecting my friends to shower me with the same love and attention.. i was very disappointed.. oh yes! took me a while.. and plenty of healing.. and then i understood that it was never about them.. but about me.. i expected others to have as much love as i did. i began saying no.. i began living for myself.. i began being selfish in a healthy way… putting myself first before friends and relatives. i mattered to myself. i mattered to my kids and husband. when i let go of so many relationships.. oh boy the fresh air.. my heart had broken free. i started living all over again. i stood my ground and i was firm in my truths. i never blamed others again. they were living in their own limitations. people cannot give what they have never had in the first place. u can only love and give how youve been brought up to do so. in my family as a child love was huge .. it was amazing.. it was explosive.. my parents were and still are big in showing love in all ways. im 44 .. and my day feels wierd if i havent apoken to my mum and say love you.. we fight and yell sometimes.. but our love is deep and united. and its been passed on to my 4 kids.. the i love yous echo every morning and through out the day and at night.. haha.. people can only love and give depending on how they were condutioned to do so as kids i guess.. i remember a friend of mine telling me she was never shown that much love wen she was a child.. and wen me and her became friends she was stunned at the extent of my love and giving.. not saying everyone is the same.. but its all about the conditioning .. and to break free we need to dare to change our thoughts.. we need to dare to take the reigns of our own life.. boundaries has always been a topic that interested me as i never had boundaries.. i always gave.. and was always seeing it as a weakness to allow myself to recieve.. until i was guided. and oh my god it felt amazing to recieve. and i dared to allow myself to recieve when others wanted to show me their appreciation of my friendship. giving and recieving is amazing. also learning to distinguish those who take advantage is important hence saying no is important. and then obviously once we make that shift.. and become our own truth.. feeling the flow of love in our hearts when we give and not expect something back is absolutely freedom! give because with love and you instantly become a recipient. spirit recognises truth. my kids are my biggest teachers.. all old souls and im grateful they chose to be with me as they constantly put all my life lessons to the test.. besides my own guru ji who has guided me to where i am now… together with my 4 kids… my life is one of gratitude and love.. I had the same epiphany as you Dr. Shefali and it feels so good now. It is true, when it feels as the right thing to do, we are in tune with our soul and our heart starts singing. It feels as if helping someone is truly a wonderful opportunity to experience joy within. And when it does not feel right to help someone it might open up the space for someone else to step in this person’s life, who knows? So much wisdom and clarity here! The “give & take” notion makes things superficial and unauthentic. To be able to give from your essence, knowing that you are receiving simultaneously, shifts the mindset and the experience. What a brilliant perspective!!!! Thank you for your wisdom! Thank you for the ah ha moment. The new awareness is another layer revealed! Thank you Dr Shefali for your insight and wisdom. Your words have transformed my thinking and empowered me to stop being the victim and to be the warrior. I used your advice in a difficult relationship that I have with a family member and by understanding and acknowledging that I was the giver for selfish reasons I was able to start to repair a broken relationship. Being a giver is part of my dna, I will continue to be that person but by acknowledging that this is my agenda and that I cannot force my agenda on others I am able to be free of their actions towards me. I love that feeling of freedom, the feeling of empowerment, thank you. I can’t even adequately comment as the above extra-ordinary women have done it best. We need to read and share more of these types of Dr Shefali pearls of insight and wisdom. 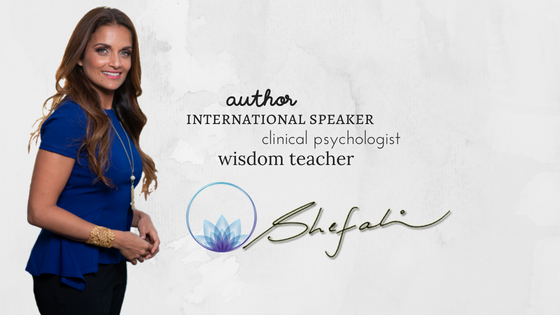 I cannot ever thank Dr Shefali enough for sharing her wisdom and insight with the world. Thanks for sharing this. Truly,when you give with a good intention,your joy has no bound. In time past,I have been a victim too of wanting to give,so as to be seen as good. But when the scales falls off your eyes,it becomes,a different ball game. Pray we live a conscious live. I absolutely love your blog and find nearly all of your post’s to be just what I’m looking for. Would you offer guest writers to write content for yourself? I wouldn’t mind creating a post or elaborating on most of the subjects you write related to here. Again, awesome weblog! I toss coins in parking lots because I know someone will smile when they find them. I never thought of it as giving and receiving but after reading this I think it might be. I mean who doesn’t smile when they find a penny? It makes me smile knowing that it might happen. Peter is now back with me and this spell caster brought my husband back to me in 2 days, someone who left me for 4 years now.